As a result and as the crown of the first edition of the International Summer School of Latin American Studies, we proudly present its Collection of Papers. the translation of the Galeano’s essays done by one of the members of the selection committee who was one of the people in charge of this Collection of Papers publication. This diversity of papers allows us, to some extent, to show the spirit of the School, and that is it is dedicated not only to students and researchers, but also to young activists, representatives of both the nongovernmental and governmental sectors, as well as to all Latin America lovers. 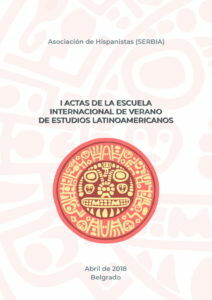 The aim of a Collection of Papers of this type is the diversity of topics (literature, anthropology, identity, international law, post-globalization, sociopolitical relations), as well as the very diversity of what is called the area studies, to which Latin American studies belong to, and which represent the diversity of perspectives, approaches and topics that investigate a particular region. You can download The Collection of Papers free of charge by following this LINK.